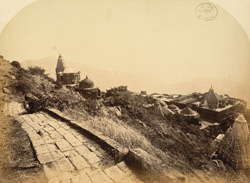 Photography of the Neminatha Temple on the Girnar Hill, near Junagadh, from the Archaeological Survey of India, taken by D.H. Sykes around 1869. Mount Girnar rises more than 900 metres above the plain around the town of Junagadh. It was an important pilgrimage centre since the 3rd century BC. The mountain is particularly sacred to the Jains but there are also several Hindu temples and a Muslim shrine. Along the principal path that leads to the central peak there are gateways, shrines and tanks and the principal group consist of sixteen Jain sanctuaries dedicated to Neminatha. These temples date from the Solanki period and later. The Neminatha Temple is the largest of the temples on Mount Girnar, built in 1128, with later additions. The temple stands in the middle of a courtyard surrounded by a colonnade with seventy shrines. The principal mandapa or hall has a pyramidal roof of miniature pot finials and the ceiling is supported by granite columns. The corbelled dome over the central bay is elaborately decorated in the Solanki style. Few of the original sculptures and mouldings have survived and the clustered tower is a later addition. This view is taken looking south with the Neminatha Temple and mountain below.